KidKraft 27pc Pastel Cookware Playset Just $7.97! Was $21.99! You are here: Home / Great Deals / Amazon Deals / KidKraft 27pc Pastel Cookware Playset Just $7.97! Was $21.99! 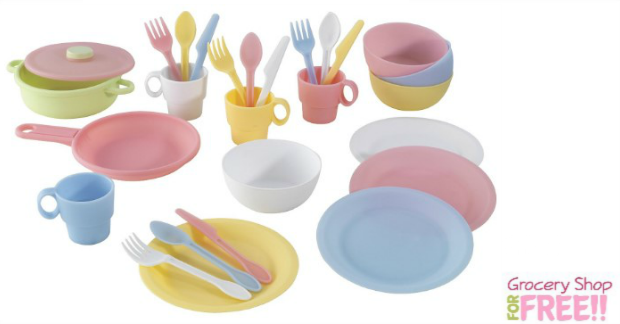 Right now you can get a great deal on this KidKraft 27pc Pastel Cookware Playset! Right now it’s just $7.97 down from $21.99! To compare this same set is $13.50 at Walmart! fill out this fun ensemble. All items are made of safe plastic with curved edges. This play set can be used by multiple children at the same time during a play date or other type of get-together. It would make a great gift for a birthday, holiday or other special occasion. The KidKraft 27-Piece Kitchen Play Set, Pastel can be paired with play food items (sold separately) so your child can cook up all sorts of imaginary culinary creations for family or friends.